Have you heard? The mommy blog world is so thrilled for Katja! She had some rough times last month and wrote a fantastically inspirational post called How the worst in life can become the best in life. Well, it seems like things are going her way, finally. In celebration of her marketing windfall, Katja will be sponsoring several Skimbaco giveaways at various blogs. Keep your eyes peeled! 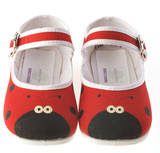 You could win a pair of Suri's Ladybug Shoes or a Skimbaco gift certificate! Those ladybug shoes are so adorable. Love the shark lunchbag under boys accessories.